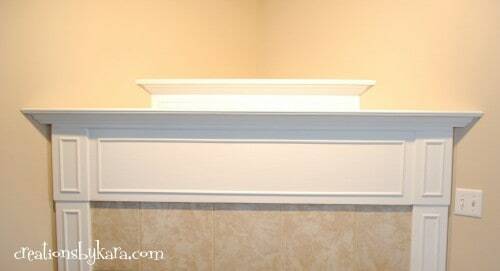 This post was supposed to be an actual step by step tutorial on how to paint an oak mantel. But all my hard work went down the drain when my SD card died, so now you just get a couple photos. All my “before” shots bit the bullet. 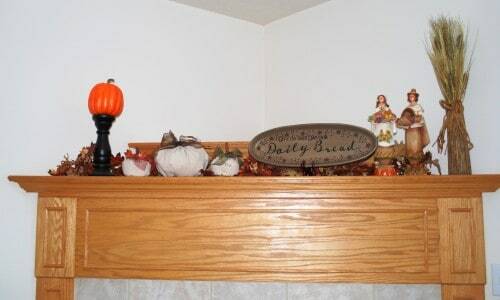 But I did happen to find an old photo of the mantel on my computer. We’ve got a corner fireplace. When we built it we thought it was unique and awesome. But oh my gosh it is hard to decorate around! But it can’t be moved, so I knew the best I could do was make it look better. I got soooo tired of the oak. And I realized that every single photo I ever saved of fireplaces I loved had one thing in common. They were all white! I’ve been wanting to paint mine white for ages, and I finally got around to it. Hallelujah!! Here is what it used to look like: Here it is after sanding, some Liquid Sandpaper, a couple coats of primer, and a couple coats of white paint. 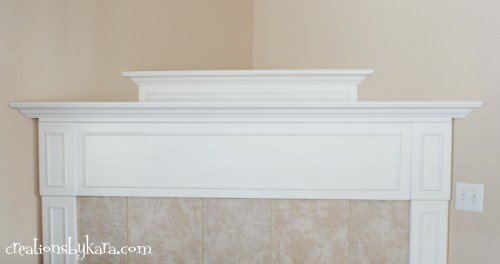 I used Valspar Satin White. I did notice that since we added a covered deck on the back of our house, this little corner doesn’t get much natural light any more. So taking a decent photo really stinks, especially during the cloudy days of winter. But I sure love the clean look of it now! When I turn the light on, it looks like a totally different color of paint on the wall. So crazy! I know there are some out there who will say that you shouldn’t paint oak. That you shouldn’t paint over any wood for that matter. Don’t let that stop you. The most important thing is that YOU love your own home. Don’t be afraid to change something in your home decor that you hate. If you want to try it, go for it!! going to send traffic to the CPA offer. Here you can talk about the past job experiences, skills and accomplishments. Oh I wish I had the guts to do my fireplace. To those people who think you can’t paint wood, all I have to say is “haven’t you ever heard of paint stripper!”. It looks great in white, but what is this liquid sandpaper you speak of? I found it near the paint stripper. It’s just called Liquid Sandpaper. The fumes are pretty strong, but it does work great for pieces with little nooks and crannies. It takes off the outside finish so the paint will stick to the surface. Very handy! 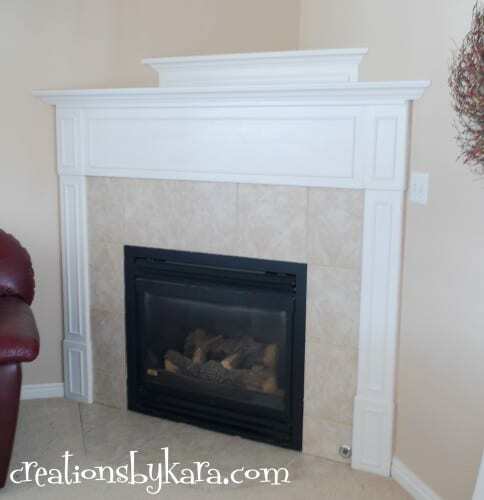 what kind of paint did you use to paint the brass on your fireplace? I sooo want to do that too. I hate brass! I LOVE it! I’m such a sucker for white. I think it looks great!